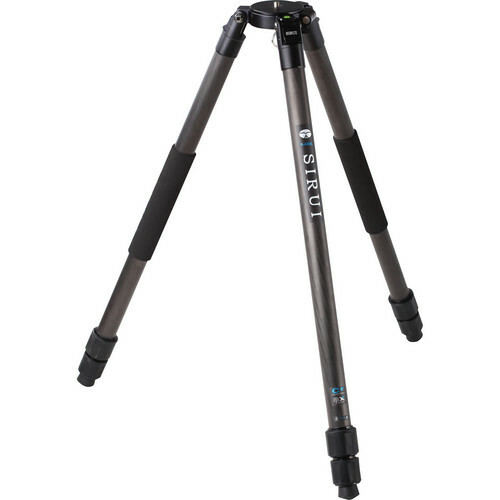 The Sirui R-4203L 3-Section Carbon Fiber Tripod is a heavy-duty tripod model that is equally well-suited for photography and professional video capture – especially for field production, considering its light weight. The R-4230L reaches a maximum height of 70.8" and supports heavy loads up to 44 lb, yet weighs just 5.3 lb. This is a tripod you'll want to take on location as you work with heavy large-format cameras, or on wildlife photography expeditions as you mount heavy telephoto lenses to gimbal heads. With retractable stainless steel spikes in its rubber feet, the R-4203L is suitable for a variety of terrain types. The tripod features automatic leg-angle lock mechanisms; these can quickly set the legs independently to two different angles, for creating a level camera support on uneven ground. The carbon-fiber tripod also features a large range of heights: from its 70.8" maximum, the support achieves a minimum height of only 3.5", thanks to its lack of a center column. The tripod plate is replaceable, making the R-4203L compatible with optional 75mm or 100mm bowl adapters (not included) for ball-leveling heads. That way you can use the tripod with a traditional pan/tilt head for medium to large camcorders and digital cinema rigs. There's also a built-in bubble level on the tripod to ensure you've got a reasonably level base before you mount a head. Box Dimensions (LxWxH) 32.0 x 6.0 x 6.0"
R-4203L Carbon Fiber Tripod is rated 5.0 out of 5 by 5. Rated 5 out of 5 by treaves from Great tripod. Landscape & portrait photography. It is a bit longer then some travel versions, but, it very stable, Overall, a very nice tripod. Rated 5 out of 5 by Gomper from Best Buy This is by far the best carbon fiber tripod for the money. I own Gitzo carbon tripods as well and I prefer the Sirui over the Gizo. Lighter and smoother operation. In fact I just picked up a second Sirui to replace another Gitzo tripod. Rated 5 out of 5 by Fairwindschance from Love this tripod! Use this for equine related video work. Love how quickly this tripod sets up in outdoor and unlevel footing. Very solid and elegantly made. Was up in the air between Manfrotto 535 and this manufacturer - very glad I went with this make! Would I be able to use a Wimberley WH 200 gimbal head on this tripod? Yes, the Sirui R-4203L 3-Section Carbon Fiber Tripod will be compatible with the Wimberly WH 200 Gimbal Head. Will this tripod fit in it's bag with a Sirui k40 ballhead attached? nah it wont. you have to unscrew it and put it in between the legs. It is kinda annoying but the tripod cannot be beaten. it is so strong. What would I need to make this tripod compatible with a Cartoni focus hd fluid 100mm head?parts and cost would be appreciated. If you head receives a 3/8 thread, regular head size, it will fit.